Last month, the Armenian Church of Southwest Florida (ACSWFL) mission parish collected $1,067 as part of the Diocese’s Department of Mission Parishes food drive for children in need. 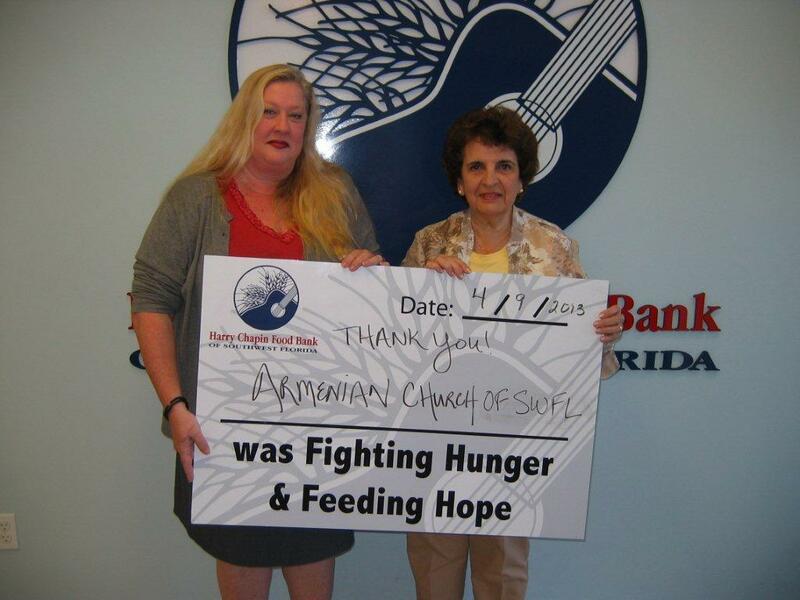 The funds were donated to the Harry Chapin Food Bank of Ft. Myers, in memory of the children who were victims of anti-Armenian pogroms in Azerbaijan (1988-89) and the war in Nagorno-Karabagh (1991-1994). The Harry Chapin Food Bank serves five counties in southwest Florida: Charlotte, Collier, Glades, Hendry, and Lee. In 2011, they distributed 15 million pounds of food and other grocery items valued at $24.9 million, to more than 160 non-profit partners who serve more than 30,000 people monthly. This is a first-time collection for the ACSWFL, and they intend to make it an annual event.